Aaron and I recently got home from Hawaii. It was an amazing trip, particularly since we were able to visit both Maui and Oahu. We played at the beach, went snorkeling, hiked all over the place, visited the typical tourist sites. We did everything you are supposed to do when visiting Hawaii. However, we spent very little money. Aaron had to go to Hawaii for work, so we paid for both of my flights, a rental car and some of my food. I haven’t had time to total all of the bills, but for an 11-day trip to two island, we spent less than $1,600. For two weeks my personal Instagram feed was full of amazing pictures and videos. I had a ton of friends tell me how jealous they were – heck, I was jealous of myself. Very few people at that time knew how little we were spending for this vacation. I’m not sure what a regular trip would have cost us, but can assume it would have been at minimum $4,000. Paying for hotel rooms alone would have easily added an additional $2,000, not to mention the extra flights. We were very lucky to have had such a fun vacation for such an inexpensive price. Aaron had to work about half the time, but still had enough free time to enjoy the island. All in all, we came out ahead. I must admit, it was really fun to have a small taste of the “high life”. We definitely looked the part of high-rollers. For one of the first times in my life, I saw how addictive the spending mentality can be. It is so easy to get caught up in the experience and just spend, spend, spend. After all, we were in Hawaii. There were so many things to spend money on and experiences we could have had. After getting home to my ordinary life, I had that moment of let down. You know the one where you have to get back into your boring routine. I had loads of laundry to do, cleaning, tons of work to catch up, blog posts to write – my to-do list was out of control. It wasn’t fun coming back to reality. I really wanted to just run away for a bit and take a longer vacation. I spend a lot of time writing about personal finance and encouraging my readers to budget, get out of debt and have an emergency fund. These are all super important things. However, I realized after this trip, that I’ve missed the boat. There is one key to personal financial success that I’ve never addressed. The Key to Personal Financial Success is the Fine Art of Contentment. You will never be able to get ahead financially unless you can learn to be content with what you have. You have to be willing to sacrifice and spend less than you make. I’ve had to learn to make do with what I have and find my own happiness. I’m not talking about contentment in terms of not wanting and reaching for more, I’m talking about being able to be happy in the moment with what you have. It sounds so simple, but I firmly believe that learning to be content in the moment makes it significantly easier to be financially successful. When you are happy in the moment you aren’t constantly looking at your friends and finding yourself falling short. You don’t obsess over the latest clothing, cars, home décor or all the other things retailers are constantly trying to convince you to buy. You don’t spend all your energy feeling sorry for yourself because you aren’t the Joneses. You make the everyday decision to be happy with what you have while working towards your goals. Those goals may be based on having nicer cars, homes, vacation, and clothing, but those things don’t define you. What defines you is being happy with who and what you are. 1. The easiest way I’ve found to be happy is to concentrate on what I do have. There isn’t a magic pill that is suddenly going to make you content. You have to choose every day to be happy. Somedays being happier is harder than others. I’m a religious person so I daily thank the Lord for the blessings in my life. I make it a goal to thank him for different things every day. Some days it is harder than other, but when I sit back and think through my day, I can always find something that brought me joy. If you aren’t a religious person, I recommend a Thanksgiving Journal (actually I recommend this either way). Take a few minutes each day to write down a few positive things in your life. I’ve found that as I constantly search for the positive, it is always there for me to find. Don’t get so caught up in the big things that you forget to notice the little things that make you happy. Today, I’m thankful for a husband who sits down and reads to our grandson and daughter. I got home from running errands to this little picture of perfection. Today, I’m thankful for this blog and the timely reminder that writing this post gave me of why contentment is so important to me. My life isn’t perfect, but I choose every day to be happy and I’m going to continue to make that choice every day. Once you’ve learned to be content in the moment the next step is the one that has the most potential to change your life. I don’t care what your goals/dreams are, the what doesn’t matter so much as the how. Work towards making a better life for yourself. There is nothing wrong with wanting more, even if that is “material” thing. In my opinion, it is great to want more out of your life. What sets you apart is a willingness to work for what you want rather than expecting people to give everything to you on a silver platter. I’ve worked very hard to have a successful career and make good money. I’ve worked very hard to have a nice home. I’ve worked very hard to be a good parent. I’ve worked very hard to have flexibility and freedom in my life. If you want more out of your life, set SMART Goals that will help you achieve your dreams. Learn to be happy with what you have while constantly striving to be just a little bit better and do just a little bit more. If wanting more means changing careers then find a way to make it happen. Don’t be scared to dream big and find ways to reaching your ultimate goals. Being content isn’t about stagnating in the same spot. If you aren’t progressing and moving forward you are actually moving backward. Being content is about constantly moving forward as you grow. This post kind of got away from me and is really about more than just personal finance. I think it is applicable to pretty much all aspects of your life. Don’t settle for less than you should be in your life. Dream big and work towards your dream while focusing on the little moments of contentment that make you happy. The Make Over Series by Crystal Paine of the Money Saving Mom. She offers the following online classes that will help you organize your life for increased productivity. SMART Goals resource Page from LeadershipYou – I highly recommend downloading their free SMART Goals resource guide. I don’t think most of us will ever be completely content. Like you said, I want to dream big and will always continue to dream big. However, I want to learn to be happy in the moment. I want to always have goals and dreams, but not get so caught up in them that I can’t be happy with the little things that I have in my life. For me it is all about creating those little moments of peace in my crazy world. 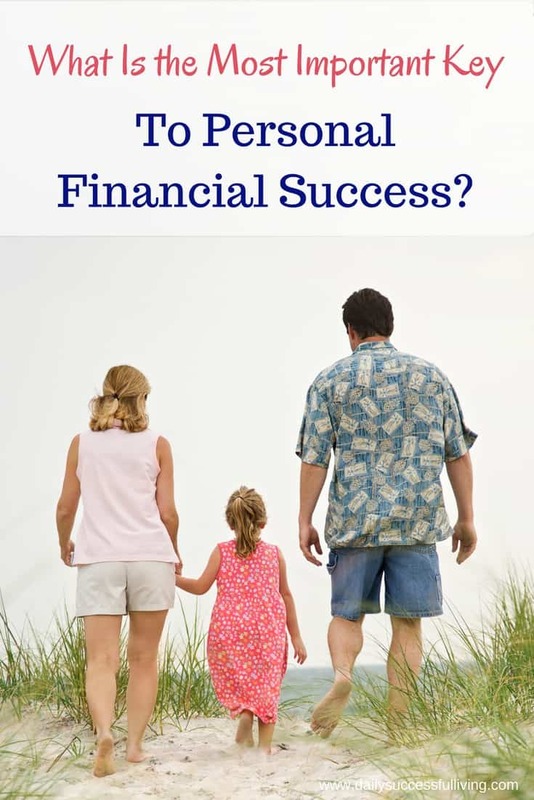 Interesting that you connect gratitude with personal financial success. I also believe in the importance of positivity and being thankful for the things we have in our lives, but I never thought one might drive the other. Maybe you’re on to something : ) I do agree that focus is really important: you have to know why you’re doing it—sacrificing, working longer hours, etc. For me, my kids are very young and I really want the financial freedom to stay home with them. I am working towards building financial freedom so I can be with them, but it’s a long, uphill road. You nailed it. If you don’t have a strong reason for the sacrifices you aren’t going to stick to it long term. Right now I’m able to work part-time because of the sacrifices we made to get out of debt. Every little sacrifice we made is paying off now. Good luck with your uphill road. You can do it!